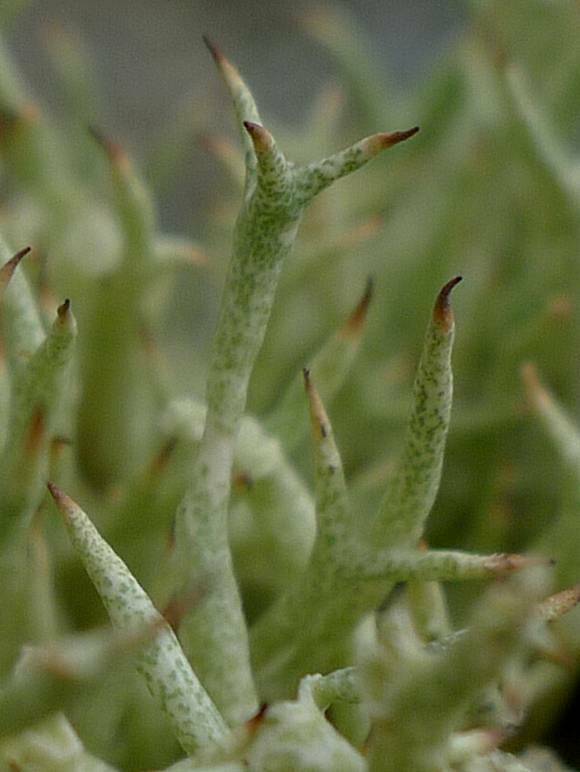 Much more 'spiky' in appearance than other Cladonia species. 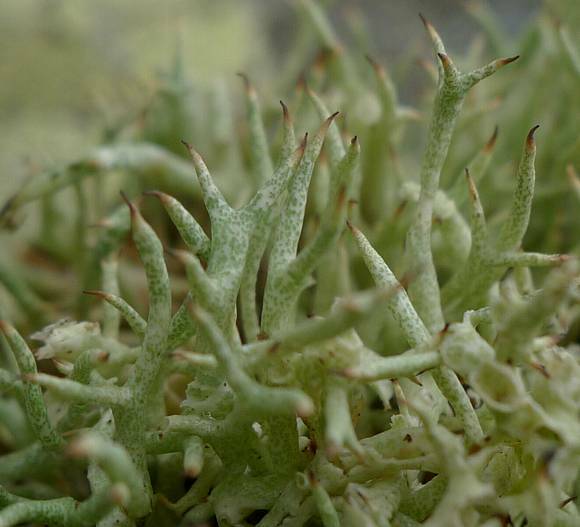 Cladonia Portentosa top left for comparison: it is greyer than the greeny-grey of Cladoonia uncialis (some lichen become greener when wetter, but this is the same location for both, and thus the same degree of moisture available). It is free-standing, without roots. Your Author moved it onto the top of the stone for photography, before replacing it into the peaty hollow between stones. Like many Cladonis species it is hollow inside, but also un-like most, it has what appear to have been broken in many places. It is thin-walled and brittle. 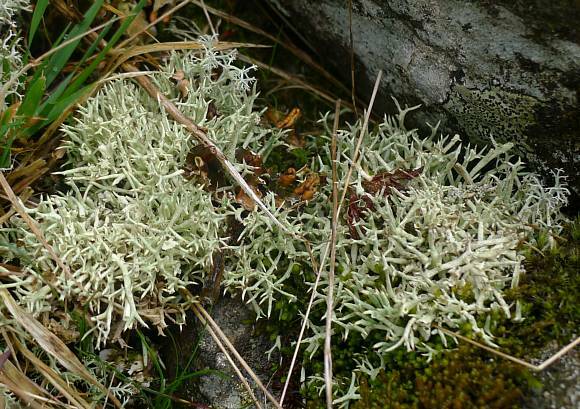 It does not branch as many times as most other Cladonia species of this form, and the branches taper conically but gradually into a spike. 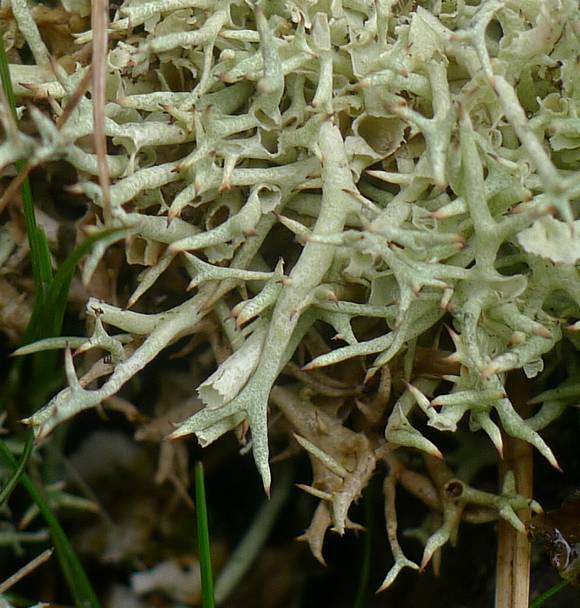 It seems to be the tops that are the most 'broken', so perhaps it is squirrel or bird damage rather than frost. Un-damaged spikes taper to a 'sharp' point, which gets ever browner towards the tip until it is nearly black at the apex. 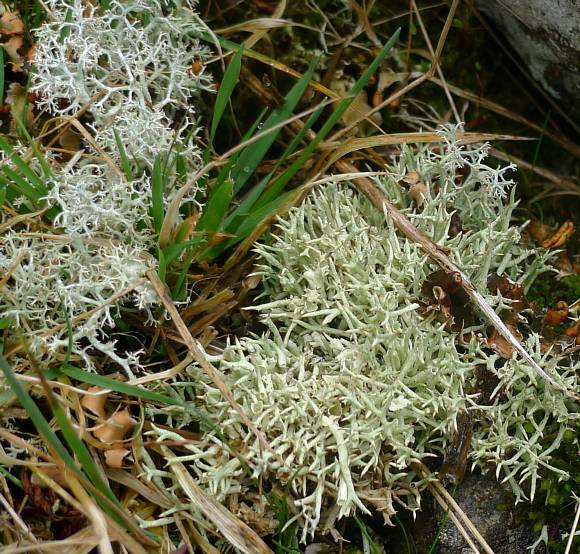 Un-like most lichens, it is not covered in powdery soredia nor in flaky squamules, but is smooth. 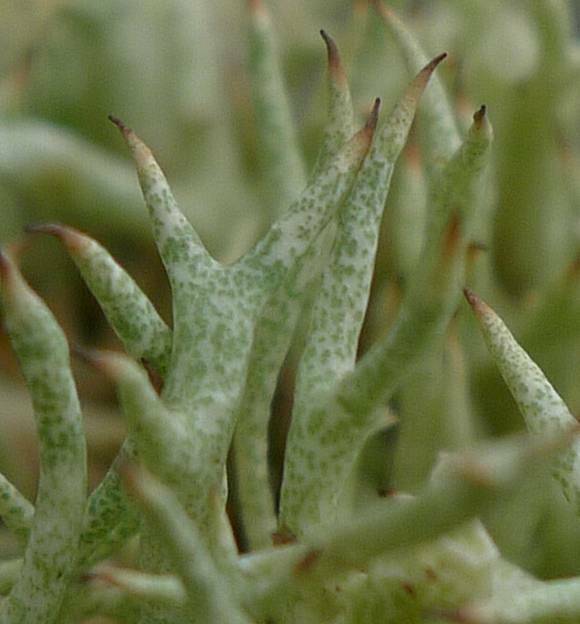 Terminates in clusters of points, from one up to six, splitting symmetrically, but two or three branches are more common. 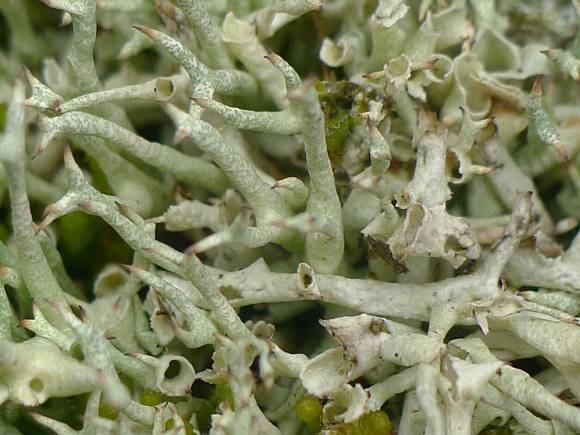 The body is blotched with green and grey irregular splodges. Presumably the greener parts contain more algae and therefore chlorophyll. The points ever browner to the tip. 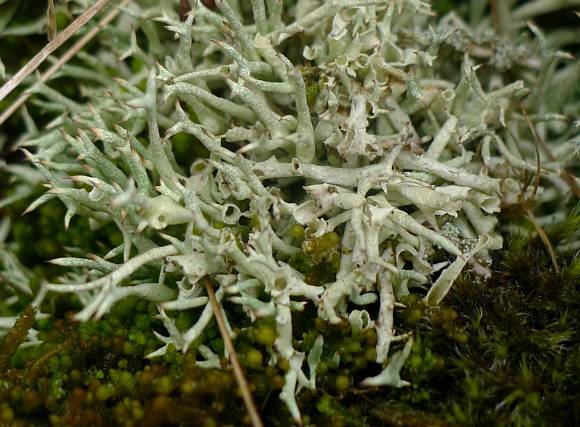 Easily mistaken for the sub-species : Cladonia uncialis ssp uncialis but that is much scarcer than this sub-species of Cladonia uncialis and appears to have not only holes caused by pieces being broken off, but holes that have grown that way. Also, ssp uncialis has a tendency to have a hole at the top from where up to six shorter points radiate. Both species have brown points. 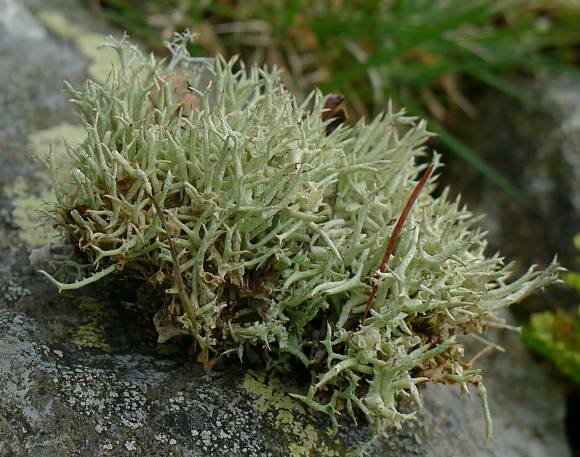 The species list for Duddon Mosses lists Cladonia uncialis as being present.